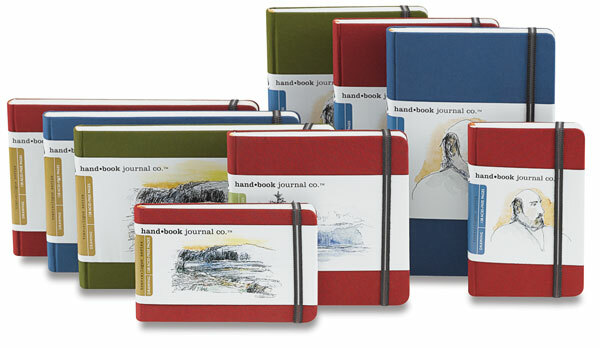 Attractive and functional, a hand-bound, sketch journal covered in book cloth is the perfect travel companion for artists. Each journal features 128 buff colored blank pages, a durable elastic closure, and a useful clear plastic envelope to hold notes or business cards. The heavyweight sheets are 130 gsm (normal drawing paper is 80 gsm) and acid free. They have a light, toothy surface that accepts pen-and-ink, pencil, markers, and light watercolor washes without buckling.